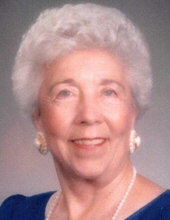 Salina, Utah - Virginia Dee Rasmussen Dickert, age 99, of Salina, passed away Sunday, March 31, 2019 in Centerfield. She was born January 18, 1920 in Salina, Utah, a daughter of Ira Alvin and Dagmar "D" Larsen Rasmussen, early settlers of the area. Her grandfather, Niels C. Rasmussen, was among the small group of scouts sent in October of 1861 to find a desirable settlement for Mormon Pioneers. In February of 1862 he helped lead the first pioneers to the settlement which later was called Salina. Virginia graduated from North Sevier High School, Class of 1938. In 1939 she married James Ray Dickert. who was stationed in Salina in the Civilian Conservation Corps. When the US entered World War II, Mr. Dickert volunteered for the Army Air Force, was accepted for pilot training and later became pilot of a B-24, flying missions over the Southwest Pacific. He also flew bomber missions during the Korean war, retiring as Major Dickert in 1960. Virginia was with him during his assignments at bases in Arizona, California and New Mexico, and waited out his Korean War duty in Washington State. After his retirement, the Dickerts returned to Salina and went into business, opening and operating a coal mine and later the Midway Diesel Truck repair facility in Salina. Mr. Dickert passed away November 17, 1980. Virginia then put her intelligence, remarkable energy, and experience into volunteering for projects relative to the quality of life in her home town. Interested in improving the environment and preserving the ecology, she spearheaded a drive to assure the preferable sighting of the road to the relocated town refuse-collection point. She oversaw and was deeply involved in collecting monies and placing of modern street signs. She initiated and carried out collection of donations for purchases, planting and care of evergreen trees along the boundaries of the Salina Eastside Cemetery. Once again she was the spearhead of a drive for another improvement, this time for the entrance to the Pioneer Cemetery in Salina. Her enthusiasm and persistence brought a dignified, handsome entrance to that resting place of pioneers, as well as many of their descendants who rest quietly there today. Virginia was an avid amateur historian, through her, research becoming almost a walking encyclopedia of the "olden days" and the "not so olden days" in Salina. She become the leader of the Civilian Conservation Corps veterans, their wives and widows in efforts to give life to the memory of the conservation work the young men in that organization did during the dark Depression years of the mid-1930's. The group has erected commemorative signs at the Salina base camp site, at the Fish Lake National Forest and at the Maple Grove recreation area. She was also very instrumental in the preservation of the Civilian Conservation Corp Camp in Salina and the history of the Salina Massacre. Virginia spearheaded the drive for a Salina Museum, collecting considerable memorabilia of earlier times, to pass that information to the younger generations who might otherwise be unaware of their past. She believed that we must know where we came from, in order to know who we are and where we are going. Virginia is survived by her sisters: Shirley Probert of Scipio; Dona and Paul Martin of Las Vegas, Nevada; sister-in-law: Shirley Rasmussen of Colorado; as well as numerous nieces and nephews. She is preceded in death by her loving husband, James; her parents; and her siblings: Leath and LaFay Rasmussen, Maurice Farrell and Thressa Rasmussen; Ray Rasmussen, Bernice and Fred Mickelsen; and a brother-in-law: Bud Probert. Funeral services will be held on Thursday, April 4, 2019 at 12 Noon in the Salina Creek LDS Ward Chapel, 85 South 100 East in Salina. Friends may call for viewing at the Springer Turner Funeral Home in Salina, Thursday morning from 10:00 to 11:30 prior to the services. Burial will be in the Salina Eastside Cemetery under the care of the Springer Turner Funeral Home of Richfield and Salina, Utah. To send flowers or a remembrance gift to the family of Virginia Dickert, please visit our Tribute Store. "Email Address" would like to share the life celebration of Virginia Dickert. Click on the "link" to go to share a favorite memory or leave a condolence message for the family.